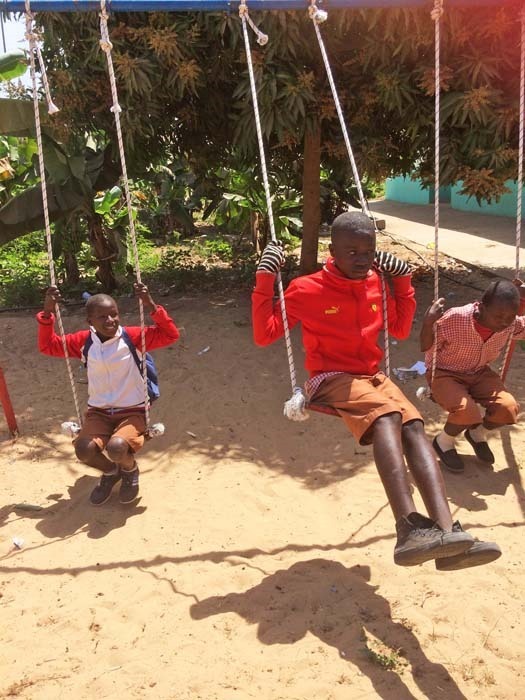 The playground at the only school for the blind in the Gambia has been repaired thanks to a cooperative effort between the Friends of Visually Impaired Children in the Gambia charity (FGVI) and Rug Aid. I spotted that post and contacted her as a trustee of FGVI. Back in 2007 my partner, David Pointon (a founder trustee of FGVI), and I had introduced Heather to the Gambia and to GOVI. Heather lives “just over the hill” from us in Reeth, Swaledale. FGVI was set up in 1998 after an appeal from GOVI for assistance. At that time the school was housed in a small tin-roofed extension to another school. “We raised the money to build the school and other buildings, and to provide the children with the playground,” David said. 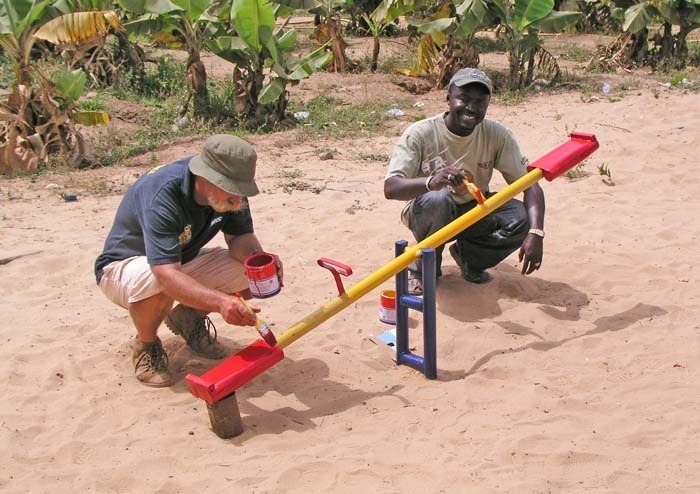 When the charity’s chairman, Phil Feller, visited the Gambia with his wife, Joan, in November last year they too were determined to see the playground repaired and authorised Lamin Saidy to find a welder. But then came the chaos that followed the elections and the welder was among those who fled. 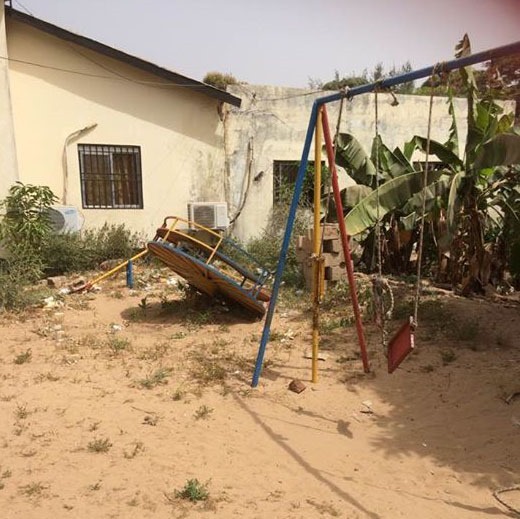 He returned in February and it was agreed that Lamin Saidy and Rug Aid would cooperate with the playground repairs. So Heather and her daughter, Chrissie, were able to watch the transformation taking place. Heather rents one of the buildings on the GOVI compound that FGVI had built. It is well cared for by Ernest Faal, one of her first blind rag rug makers. He manages the project when she is not there, does the marketing and has encouraged the school children to learn rug making. There were about 30 men and women a day attending the workshops in February, some with their babies. “We are very proud of them,” Heather said. While she was helping them, drawing patterns, hemming, and sorting fabrics out, Chrissie was giving mobility training including how to use the white canes they had brought from England. She also trained teachers in how to help the blind and visually impaired. Even though they were so busy they found time to assess some of the other needs of the school. Between 2009 and 2011 FGVI worked with the UK Parliamentary Football Club to provide the school with a goal ball court. Sadly that court is now badly in need of repair.So supporters of Rug Aid are now trying to raise funds for that. It is planned that this and other repairs at the school will be carried out as another joint Rug Aid and FGVI venture.